Chorlton Beer & Cider Festival have teamed up with Chorlton’s own Bootleg Brewing Co to offer a local home brewer the chance to have their own beer on sale at the festival and in selected Holt’s pubs across the area for Manchester Beer Week. The beer will be brewed in time for the Festival and Manchester Beer Week at the brewery at The Horse and Jockey Pub. The winner of the Home Brew competition will brew their recipe on a commercial scale with Stef Occhi, Head Brewer for Bootleg. The winning beer will be racked into casks for Chorlton Beer Festival and sold through selected pubs in Manchester. You will name your own beer when you enter and the Bootleg Brewing Co will design a pump clip for the winner. On top of that, The Bootleg Brewing Co will also bottle some of your beer for you to take home. The challenge which has been set is brew an Anglo American Beer. This can be English / American Hops or English Malt / American Rice. Anything that combines these two countries in a beer can enter the competition – click here for full details. 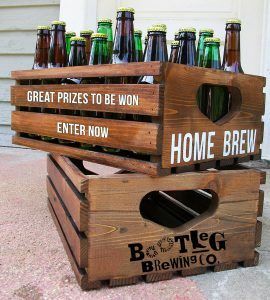 The Home Brew competition will be judged by a panel of experienced and respected judges at a tasting in June. An Awards Ceremony will be held at the Horse and Jockey with a party for all entrants.